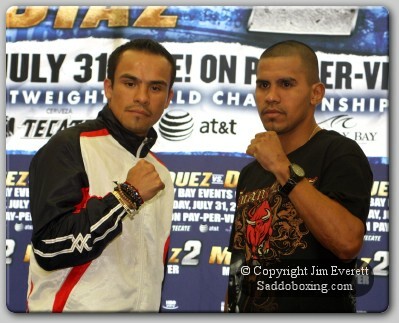 17 months after Juan Manuel Marquez defeated Juan Diaz for the WBA and WBO lightweight titles, the pair go at it once again as they square off tonight at Mandalay Bay Casino in Las Vegas. 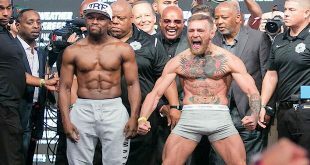 Both boxers are coming off losses in which they went up in weight. Marquez, 50-5-1 (37), jumped all the way to welter to get outboxed by Floyd Mayweather Jr last September while Diaz, 35-3 (17), traveled to light welter where he faced Paulie Malignaggi in a pair of NABO title bouts, winning the first before losing the second contest in December. 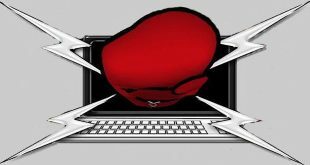 When Marquez and Diaz met the first time it was after Diaz had come off two very punishing fights against Michael Katsidis and Nate Campbell within a six month time frame while Marquez had also been in tough bouts against Manny Pacquiao and Joel Casamayor, also over the course of six months. For the rematch tonight, both should be well rested and it could be a very different bout than the first contest, won by Marquez via a ninth round stoppage. The outcome in Las Vegas will probably come down to who has more left in the later rounds. At 26, Diaz is ten years younger than his opponent but will have to conserve his energy against the hard punching and more accurate Marquez if he is to avoid the same outcome as their first clash. But can 36 year old Marquez continue to defy the aging process and hold off a younger, stronger and possibly an improved opponent? It should be interesting to say the least but in order to retake his former WBA and WBO titles from Marquez, Diaz must pull off the best performance of his career with no mistakes. The undercard features heavy-hitting and undefeated prospects Daniel Jacobs, 20-0 (17), and Dmitry Pirog, 16-0 (13), going at it for the vacant WBO middleweight title. 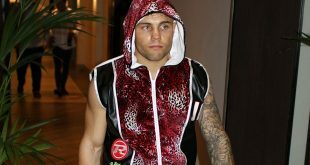 Pirog has faced a better grade of opposition but is making his first appearance in America and at 30 is seven years younger than Jacobs, who currently holds the NABF and NABO belts. There are three interesting bouts on the bill as well. Super middle hard man Sakio Bika, 28-3 (2), faces Jean Paul Mendy, 28-0 (16), in a IBF title eliminator, 39 year old ex-lightweight and super feather world champ Joel Casamayor, 37-4-1 (22), faces the much younger former feather and super feather world champ Robert Guerrero, 26-1-1 (18), over eight rounds at just over the lightweight limit while former feather and super feather world champ Jorge Linares, 28-1 (18), tangles with five-time world title challenger Rocky Juarez, 28-6-1 (20), for the WBA fedelatin lightweight bauble.